Best practices for maximizing equipment utilization, uptime and minimize warehouse expenses and material handling equipment downtime. Follow these best practices and save money in your warehouse expenses. Forklifts, material handling equipment, and warehousing costs can quickly erode business profits if not managed properly. The following best practices can help any business maximize equipment utilization, forklift and equipment uptime and minimize operating expenses and downtime. 1. Operator Training – Proper training of your forklift operators is an Occupational Safety and Health Administration (OSHA) regulation and helps reduce product and equipment damage as a result of operator error. 2. Planned Maintenance Schedule – Planned maintenance helps eliminate unexpected downtime, minimize the risk of major repairs and prolongs the life of your material handling equipment. 3. Maintain Good Warehouse Floor Conditions – Damaged concrete creates unnecessary vibration that can damage bushings, bearings, steer axles and cause premature tire wear. 4. Dock Plates – Proper use of dock plates helps minimize product and material equipment damage during loading and unloading of trailers. 5. Maintain Good Housekeeping – Keeping warehouse floors clear of debris reduces the potential of damaging materials affecting forklift performance. 6. Awareness Enhancement and Forklift Safety Options – Using awareness enhancement options, such as strobes, mirrors, and travel alarms on material handling equipment, makes for a safer work environment. 7. Material Handling Fleet Survey – A thorough fleet survey of your material handling equipment ensures that the proper forklifts is used for all required tasks and verifies that work environment conditions match equipment specifications to the application. 8. Alternative Procurement – Considering alternative procurement methods, such as long-term forklift rental or forklift lease, can offer cost savings and flexibility not otherwise available through a cash purchase. 9. Vendor Collaboration – Partnering with experienced material handling professionals, such as Ring Power Lift Trucks, will help overcome any supply chain obstacles that you may encounter. The responsibility has now been placed upon your supplier to help reduce your costs and increase uptime, while you focus on core competencies. 10. Technology – Utilizing updated and modern material handling equipment with emerging technologies have made operators more productive, comfortable and safe and can often be used to streamline supply chain management through the use of onboard scales, terminals and Radio-Frequency Identification (RFID) readers. Contact Ring Power to design a custom warehouse systems for wholesale distribution, office supply distribution, hardware distribution, manufacturing and beverage distribution. Click on the title to leave a comment or ask a question. Ring Power Lift Trucks is the material handling division of Ring Power Corporation, headquartered in Jacksonville, Florida. Additional offices service Pompano Beach, Miami, Daytona Beach, Orlando, Tampa, Ocala and Tallahassee. Ring Power Lift Truck represents: Caterpillar® Lift Trucks, Mitsubishi Forklifts, Linde forklifts, Kalmar Industrial Forklifts, Princeton and Navigator piggybacks, rough terrain forklifts by Noble, and specialized products by Bendi and productive Cascade Attachments. Electric forklifts are ideal for working indoors in many type of businesses, as well as capable of being operated outdoors, typically only on dry, well paved surfaces. 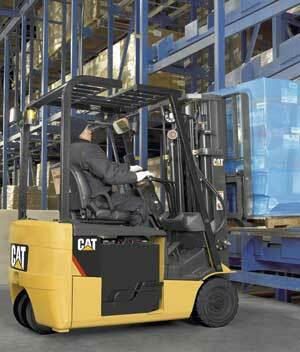 Electric forklifts are available in a wide range of capacities too. Although it is true that electric forklifts have less moving parts and require less overall maintenance, but they are not totally maintenance free. 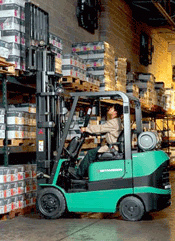 Here are a seven tips to keep your electric forklift operating smoothly. BATTERY A battery operating in extreme heat may cause internal components on your electric forklift to wear faster. A lift truck operating with less power than required can burn contactors which in turn can damage the motor and battery resulting in higher cost. HYDRAULIC OIL Hydraulic oil breaks down chemically and accumulates contaminants over time regardless of engine hours. Heat cycles also break down additives in engine oil and deteriorate lubricating capabilities, which can result in accelerated wear of the forklift's hydraulic components. CONTACTOR TIPS Worn contactor tips can stick and cause electric motors to stay in the “on” position. Failure to maintain tips can cause damage to motor and battery, resulting in higher cost. MOTORS & BRUSHES Excessive dirt and debris could accelerate wear of motor components and damage the commutator or armature. A damaged commutator bar can accelerate wear on brushes. SWITCHES Wear on hydraulic control switches may cause the hydraulic functions to operate improperly or not operate at all. The result could be unexpected downtime or damage to the product and/or front end components. BRAKING SYSTEM A maladjusted braking system, including the parking brake actuation switch, may reduce power to motors or enable the lift truck to be driven with the brake applied, resulting in accelerated wear of brake components. STEERING SYSTEM Wheel bearings, tie rods and other steer axle components wear over time. Excessive wear can result in a “loose” or “wandering” steering condition. Leaks can contaminate the operating environment. FRONT END SYSTEM Worn or cracked forks can fail without warning. Chain worn beyond 2% should be replaced. Improper mast sequencing may prohibit the mast and rollers from operating smoothly. 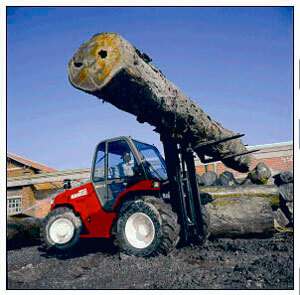 If fork heel thickness is reduced to 90% of original thickness, the lift truck should not return to service. Source: ASME B56.1 of the American Society of Mechanical Engineers Safety Standards for Low Lift and High Lift Trucks. Contact Ring Power Lift Trucks or visit lifttrucks.ringpower.com for all of our Planned Maintenance programs for electric forklifts and internal combustion lift trucks. Click on the title to leave a comment or ask a question. Is your forklift's brake system protected? Many forklifts encounter harsh environmental conditions – such as extreme temperature changes and prolonged exposure to chemicals – shift after shift, day after day. This can accelerate the maintenance needs of your forklift's braking system and compromise the operation of your forklift. As a result, individual braking system components should be inspected on a regular basis to help minimize downtime and product damage. Brake Linings – Worn or damaged service brake linings could result in poor braking performance and damage to the brake drums. 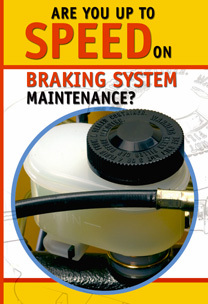 Brake Fluid Reservoir – Leakage from the forklift’s master cylinder fluid reservoir, fluid line or seals can lead to low or no fluid in the master cylinder and can impede proper braking. Drive Tires – Badly worn tires can result in loss of traction, stability and braking for your forklift. Foreign objects may cause tire damage and result in poor braking performance. Parking Brake Actuation Handle & Cable – A cracked or bent assembly of the parking brake handle can negatively impact brake operation. The parking brake cable can be damaged due to over-adjustment, which may cause the cable to stretch and function improperly. Parking Brake Caliper – The brake caliper found on some electric forklifts is subject to heat warpage if operated incorrectly. Worn discs may make it difficult to hold the lift truck on a grade. Brake Adjusters – Worn or damaged brake adjuster components, including springs and cables, can result in poor forklift braking performance. Ring Power Lift Trucks make significant investments in professionally trained forklift service technicians, state-of-the-art diagnostic tools, completely stocked service vans and excellent parts inventory to help keep your lift trucks on the job and being productive. In the long run, Ring Power Lift Trucks minimizes your risk and keeps your lift trucks running at the lowest operating cost. Call 1-888-699-7811, click or email to order your brake components for your forklift. We’re interested in hearing your thoughts on forklift brake maintenance – click the headline to leave a comment or send an email. 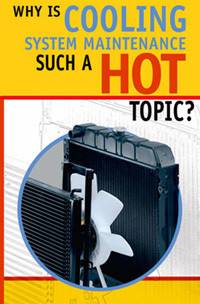 Why is your forklift's cooling system maintenance such a hot topic? Shift after shift, forklifts can encounter extreme temperature changes and prolonged exposure to harsh chemicals. Operating under these conditions negatively affects the cooling system, often causing corrosion, heat cracking, dry rot, and chemical deterioration. As a result, overheating occurs. Individual forklift cooling system components should be inspected on a regular basis to help minimize downtime and product damage. A low coolant level reduces cooling capability. Coolant also deteriorates chemically over time, leading to damage of cooling system components. Non-OEM rubber hoses often soften and then collapse, reducing coolant flow. As a result, overheating can occur. A forklift with loose belts and worn pulleys can contribute to overheating due to slippage. Clogged, bent or damaged fins can restrict airflow through the radiator core, causing overheating damage to the engine and transmission. Loose or damaged fan blades can cause the fan to be out of balance and vibrate, damaging bearings and radiator. If the radiator tank pressure cap does not maintain the correct pressure, it will not allow the radiator to obtain the proper water flow — which can cause your forklift to overheat. Since the radiator cools transmission fluid, an inefficient or leaking cooling system can result in damage to the transmission. Some forklift operating environments or applications may require optional equipment. 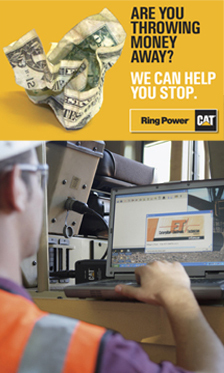 E-mail Ring Power Lift Trucks for complete details, order parts for your forklift or to schedule a service appointment. 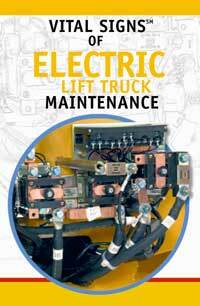 The biggest consideration of an electric forklift is the recharging process. A typical battery takes 8 hours to recharge completely and then an additional 8 hours to cool down before it is used. For example, a single charge could last from 3 to 12 hours depending on the application and other factors. If your operation has multiple shifts you may need to purchase additional batteries or, in certain instances, a fast charge system can be used. The fast charge system will reduce the need for additional batteries and potentially eliminates the need for a charging station. A battery-handling station occupies approximately 200 sq. feet or more depending on the number of electric forklifts in your fleet and number of shifts in your operation. 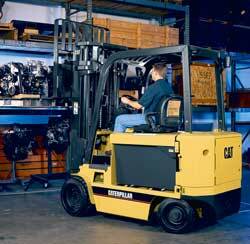 Here are some recommendations to follow when charging the battery of your electric forklift. All plants should have designated charging areas for their forklifts, especially if they change batteries at the end of each shift. These areas should have proper battery handling equipment including overhead hoists, lifting beams, battery racks and cranes, and the area must be well ventilated. A source of running water nearby is desirable and a water hose at the filling operation is recommended. The floors in battery and charging rooms should have an acid-resistant coating and be sloped toward a sump. They should always be washed with clean water after an acid spill. The spill should be neutralized with a non-corrosive, water based neutralizing chemical that is user safe and environmentally compliant. Hand-operated fire extinguishers should be available in all charging areas even if the areas are equipped with automatic sprinkler systems. For information on extinguisher class, size and mounting locations, consult local fire authorities or your insurance carrier. Ventilation is considered satisfactory if the hydrogen concentration does not exceed 2% in anyone location. Concentrations of more than 4% are explosive and dangerous. A number of instruments, such as combustible gas indicators and flammable vapor indicators, are available for continuous automatic analysis of hydrogen content in the air. Always keep tray covers and truck compartment covers open when charging a battery. This helps cool the battery and disperse the gases. Always turn the battery charger OFF before connecting or disconnecting a forklift battery. Live leads can cause arcing and sparking, which could cause an explosion if battery gases are present. In addition, the contact surfaces of the plugs or connectors will become pitted over time. Because of the explosive gas mixtures generated while charging batteries, anything that could ignite the gas, such as sparks, open flames, an electrical are, smoking, etc., must be prohibited in the charging areas. To serve as a prominent reminder, "NO SMOKING" signs should be posted in all charging areas. Visit lifttrucks.ringpower.com to view all of our electric forklifts and contact us for electric forklift batteries, electric forklift battery chargers, and supplies. In today's fast-paced business environment, renting forklifts on a short-term basis can provide much-needed flexibility and save costs at the same time. Let's go over the basics of renting and rental agreements to see how. Statistics prove companies that own their own fleets tend to keep the forklifts beyond the point where they're spending more to keep the fleet running than it's worth. Today's fuel-efficient, low maintenance, high technology forklifts can save you cash, and the more ergonomic design and improved visibility can dramatically improve safety and efficiency. If you want to rent forklifts for more than a week, it's a good idea to have a Ring Power Lift Trucks representative over for a visit. A pre-rental discussion should cover the weights and size of loads, lift heights, surface and operating condition, and any other special needs. You should also discuss optional equipment such as extra lights or backup alarms - or any special attachments you'll need to use on your forklift. For electric trucks, remember that you may need a battery charger and that many chargers must be hard-wired at your facility - which requires proper electrical service and an electrician to perform the hookup. A possible alternative is a plug-in charger, so be sure to ask about that. Because rental rates are assessed on daily, weekly or monthly rates, you should have a clear idea of how long you want to rent the forklift. Sometimes you'll get a better rate by extending the time period. Most forklift rentals are based on an eight-hour workday, a 40-hour week and 160-hour work month. Overtime charges will likely apply. Be aware that extra fees are usually charged for returning the unit in a damaged condition. Be sure to examine the forklift when you receive it, noting on the contract if any visible defects are present before you use the truck. Be sure to check your company's insurance coverage. Of course, Ring Power Lift Trucks insures the equipment, but your company must cover the operator, other people at your facility and the facility in the event of an injury or property damage when the rented forklift is in use. You can find all the information on forklift rentals by clicking here.